Mosby’s Pocket Guide to Nursing Skills & Procedures, 9th Edition, is a concise, pocket-sized study tool and clinical reference based on the best-selling textbook Clinical Nursing Skills & Techniques, 9th Edition! 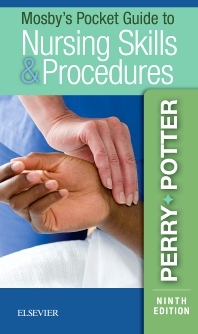 This spiral-bound presents 85 key nursing skills in a convenient, A-to-Z format. Step-by-step instructions include full-color photos plus rationales explaining why and how to use specific techniques to help you troubleshoot potential problems and take appropriate actions to address them. With the latest in evidence-based practice this essential guide is a great tool to help you safely and effectively perform core nursing skills. Clear, two-column format shows you how to perform skills, with rationales for each step explaining the reason behind the practice and the benefit to patients. Alphabetical organization of skills makes it easy to find information quickly, with each skill beginning on a new page. Special Considerations address teaching, the home care setting, and care modifications for pediatric and geriatric patients. Documentation guidelines include a bulleted list of what should be reported and recorded in the patient records. Unexpected outcomes and related interventions help you to troubleshoot potential problems and take appropriate actions to address them.